Start your review of Meagan Steele. Send a message to Meagan Steele. Thank You! Your message has been sent to Meagan Steele at Whitby Oshawa Honda. "Positive and satisfying experience . " My wife and I were in need of a vehicle . We came to Whitby Oshawa Honda where we met Meagan who helped us through the process that we expected to be quite stressful and long . Nothing of this sort have happened as Meagan handled the sale . She was extremely professional , honest and knowledgeable . She was very patient and answered all our questions with a great deal of knowledge and honesty . We got a great deal on the car and Meagan was able to give us a bit of a further discount which made us even happier as the purchase has perfectly fit our budget . A few days after we picked up the vehicle , Meagan followed up wit a phone call to ask if we were happy wit the car and we absolutely loved it ! We definitely recommend this dealership and certainly ask for Meagan when you walk in . We jokingly call her our Family Honda Sales Rep .
Purchasing a used car in a busy time with my family was made very simple by Meagan. We were very pleased with how much she streamlined the process and got us into our new car professionally and quickly. Thank you again for all you did & continued success in your career. I purchased my first vehicle from this dealership, I was walking in with no experience or knowledge when it comes to purchasing a vehicle. It wasn’t easy but with the help of Meagan and Paul, they made it possible for me to get a vehicle I wanted at a great price. They did everything they could to make sure I was able to leave satisfied and in a vehicle that would suit my needs and that was affordable. They treat you like family and gave me some great advice not only about vehicles and purchasing one but also when it comes to financing, budgeting & building my credit. I would recommend Paul or Meagan to anyone and reccomend the dealership as well, you will not be disappointed. They made purchasing my first new vehicle a great experience and were always willing to answer any questions or concerns I had in an instant and were very professional as well as friendly and understanding. "Great sales rep, bad service and experience"
Our sales rep Meagan was great, up front, honest, and helpful from start to finish of my family's experience. Service department and management is unreliable. Had to go back to the dealership multiple times for a vehicle that we were told was ready to be picked up (work needed to be done before taking it home), but then when we got there, it was not ready. Had to return 3 times total (each time being told our vehicle was ready, then upon arrival finding out it was not). On the final time, vehicle was still not ready - our sales rep Meagan had the service team clean up the vehicle so we were able to take it home after waiting. When discussing our dissatisfaction with the manager, he stated that we bought the vehicle at a very good price (the vehicle was actually the highest price of same vehicles we were looking at) and that people come from all over for their pricing so I should be happy with that. Apparently if you get a reasonable price on a vehicle, you should not expect the service to be acceptable? We were offered minimal to rectify the situation and basically told to take it or leave it. Needless to say, I will not be going back to this dealership. Meagan has been great to deal with throughout our experience. She didn't push us on anything and was very personable throughout the experience. We spent a few hours looking at cars and discussing options, all of which she stayed patient with us and helped us out with all of our questions. Even though we did not end up buying a car here (found the exact used car elsewhere), I will be recommending her to everyone. Definitely a 10/10 experience. Meagan did a great job in showing me cars that met my requirements, no pressure, very helpful. Had been looking at cars for a few months so was very thankful that Meagan found me something that suited me perfectly. She answered all my questions and even had a manager come by to help me with my decision. I was very impressed with Meagan’s pleasant attitude, not pushy and very helpful. The vehicle I purchased was exactly as advertised, and no unpleasant surprises. 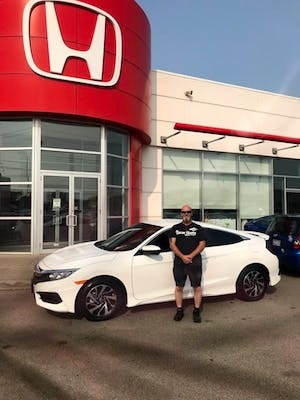 I would recommend Whitby Oshawa Honda and Meagan in particular. This is my fourth Civic and I have been very happy with all of them.